Republican U.S. 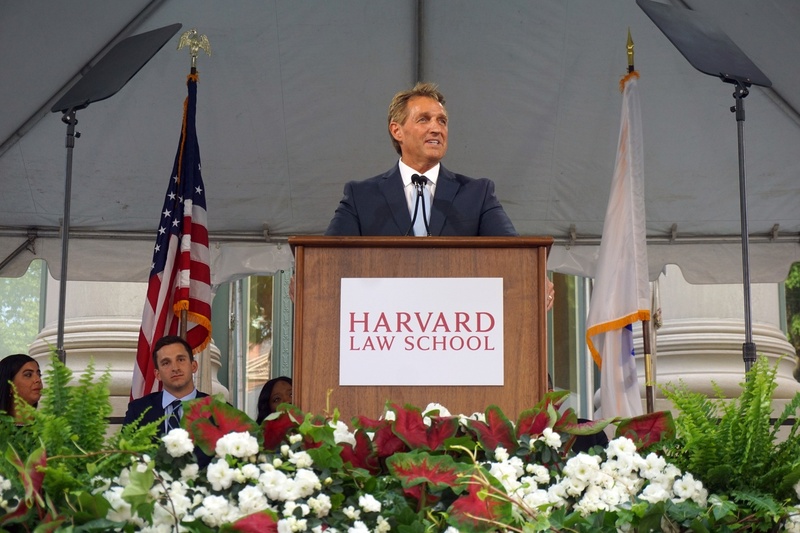 Senator Jeffry L. Flake speaks at Harvard Law School Class Day in 2018. In a conversation moderated by Kennedy School Assistant Professor of Public Policy Leah W. Rigueur, Flake condemned partisan hostility and the “toxic” state of United States politics. The crowd at the IOP — which packed the forum auditorium — was silent as Flake recalled the June 2017 Congressional baseball shooting, during which a gunman opened fire on Flake and other Republicans practicing for the annual Congressional Baseball Game. The shooting left five injured, including House of Representatives Majority Whip Steve J. Scalise. “As bullets were pitching off the gravel in front of me, I just remember thinking at that time: Why us? How could somebody look out at a bunch of middle-aged men playing baseball and see the enemy?” Flake said. Flake also discussed the fallout of another instance of gun violence: the 2011 attempted assassination of former Representative Gabrielle D. Giffords. Giffords was shot through the head and eventually resigned from her congressional seat to focus on her recovery. During the 2012 State of the Union address, Flake, who was seated next to Giffords, helped her stand to applaud Obama throughout the speech. Flake said that standing alongside Giffords sparked a disturbing amount of backlash. Flake has been one of President Donald Trump’s Republican critics in Congress, and has said that he was concerned by Trump’s behavior before his presidential election and while in office. Flake also talked about his time on the Discovery Channel special “Rival Survival,” prompting laughs from the audience. In 2014, Flake and Democratic Senator Martin Heinrich were featured on the show and spent six days stranded on an island in efforts to prove that Republicans and Democrats could work together. “We wanted to prove that Republicans and Democrats can get along, and so we planned very quietly — didn’t tell one of our colleagues that we were going to maroon ourselves on an island for a week,” Flake said. Flake said the survival challenge, though humorous, set an example for the potential work that could actually be accomplished in the Senate.